Imposter Cities chosen as Canada’s official entry to the prestigious 2020 Venice Biennale in Architecture. Impostor Cities explores how the country’s architecture is film-famous because Canadian cities often double as other places onscreen. Toronto stands in for Tokyo, for example, while Vancouver and Montréal masquerade as Moscow, Paris, and New York. The project is led by Montréal architecture and design practice T B A and David Theodore of McGill University, who aim to present new ways to recognize, organize, and experience the built environment. The exhibition plays with the enchantment of cinema. 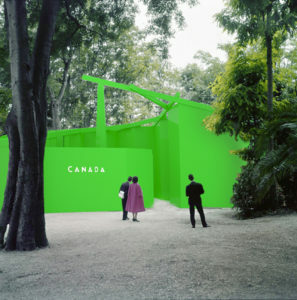 Visitors will encounter a Canada Pavilion transformed into a bold icon visible across the Giardini. Inside, an immersive experience will place visitors in movie mode, inducing a change in attitude that prepares them for an audiovisual experience composed of supercuts of scenes from selected films and television shows. Additionally, an interactive library will allow visitors to browse information about buildings—and their architects—featured in the supercuts, as well as stories about how filmmakers transform Canadian cities into cinematic impostors.